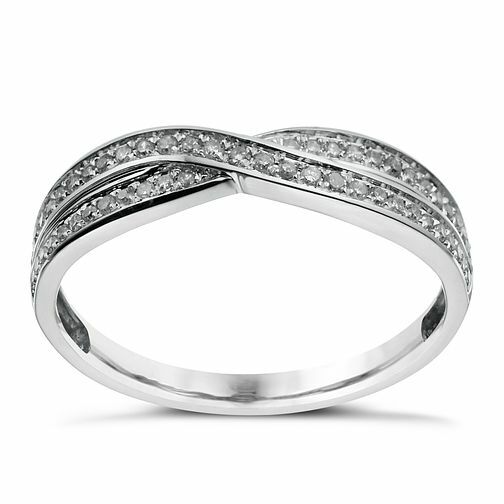 An elegant 9ct white gold, 15 point diamond crossover ring. A stunning design with simple but effective detailing, this captivating piece is perfect as a wedding ring to beautifully commemorate your special day. 9ct white gold crossover 15 point diamond wedding ring is rated 5.0 out of 5 by 4. Rated 5 out of 5 by Anonymous from Lovely ring, perfect fit and good quality My ring is perfect and the staff could not have been more helpful. Rated 5 out of 5 by Anonymous from Fantastic item Beautiful finished ring, fits perfectly with my engagement ring. Would highly recommend this product for both its look and high quality finish.